TCR transgenic 6C5 T cells recognize an insulin B chain epitope presented by the nonclassical class I MHC molecule, Qa-1b. Positive selection of these T cells was shown previously to require Qa-1b. Despite dedicated specificity for Qa-1b, evidence presented in the current study indicates that 6C5 T cells can cross-recognize a classical class I molecule. Clonal deletion was observed unexpectedly in 6C5.H-2bxq mice, which do not express I-E MHC class II molecules and thus should not be subject to superantigen-mediated negative selection. 6C5 T cells were observed to respond in vivo and in vitro to spleen cells from allogeneic H-2q mice, and specificity was mapped to Dq. Evidence was obtained for direct recognition of Dq, rather than indirect presentation of a Dq-derived peptide presented by Qa-1b. Polyclonal CD8+ T cells from class Ia-deficient KbDb−/− mice reacted in vitro to allogeneic spleen cells with an apparent frequency comparable to conventional class Ia-restricted T cells. Our results provide a clear example of a Qa-1-specific TCR that can cross-react with a class Ia molecule and evidence supporting the idea that this may be a common property of T cells selected by class Ib molecules. The vast majority of CD8+ T cells are selected in the thymus by classical MHC class Ia molecules encoded by the H-2K, H-2D, and H-2L genes. The T cell repertoire appears to have inherent germline-encoded specificity for MHC molecules (1), which is substantially edited through positive and negative selection mechanisms during T cell development in the thymus (2, 3). Selection mechanisms lead to a dedicated population of T cells that are restricted by self MHC molecules and retain a capacity to recognize foreign peptides. Positive selection ensures the survival of T cells with a low affinity or avidity for the specific selecting MHC molecules. T cells with a high affinity or avidity for self MHC-peptide complexes are then deleted during negative selection. Despite this specialized system of selection by self MHC, as much as 10% of the mouse polyclonal T cell repertoire can cross-react with allogeneic MHC molecules (4) (5). In addition to class Ia molecules, there are a large number of β2-microglobulin-associated nonclassical class I molecules encoded in the Q, T, and M regions, and at other MHC-unlinked loci in the genome (6). A few of these class Ib molecules, including Qa-1, H2-M3, and Qa-2 have been demonstrated to act as restricting elements for CD8+ TCRαβ T cells. Only a small fraction of the CD8+ T cell repertoire appears to result from selection by class Ib molecules, based on the observation that very few CD8+ T cells are present in KbDb−/− mice, which express class Ib but not class Ia MHC molecules (7, 8). Nevertheless, class Ib-restricted T cells can participate in adaptive immune responses to microbial pathogens (9, 10, 11, 12, 13), and they may play an important role in regulating immune responses (14, 15, 16, 17). The nature of the repertoire of CD8+ T cells with specificity for class Ib molecules and its relationship to the repertoire of conventional CD8+ T cells remains to be determined. The H-2 T23-encoded class Ib molecule Qa-1 is expressed in a wide range of tissue similar to class Ia molecules, but expression levels are relatively low. Qa-1 has low polymorphism, and most laboratory strains express one of two alleles, Qa-1b or Qa-1a (18). Alloreactive CD8+ TCRαβ T cells with specificity for Qa-1 can be induced by immunization with cells from mice that express a mismatched Qa-1 allele (19, 20). Qa-1 predominantly binds a nonameric self peptide, Qa-1 determinant modifier (Qdm),3 derived from the leader sequence of H-2D/L class Ia molecules (21, 22, 23). In addition to being recognized by Qa-1-restricted alloreactive T cells, Qa-1-Qdm peptide complexes serve as the primary or exclusive ligand for CD94/NKG2 receptors that are expressed on NK cells, NK T cells, and a subpopulation of CD8+ T cells (24, 25). Qa-1 also can present foreign and self peptides to CD8+ T cells (26, 27, 28, 29, 30, 31). We have used 6C5 transgenic mice expressing a Vβ5.1 Vα3.2 TCR with specificity for an insulin B chain epitope presented by Qa-1b to study the development and function of T cells with specificity for Qa-1. Positive selection of CD8+ T cells in 6C5 transgenic mice is dependent strictly on Qa-1b (32). Similarly, homeostatic proliferation of 6C5 T cells after transfer into lymphopenic hosts requires recognition of Qa-1b (33). Thus, 6C5 T cells appear to be representative of a population of CD8+ T cells with dedicated specificity for Qa-1. The phenotype and functional capabilities of 6C5 T cells are similar to class Ia-restricted CD8+ T cells. However, the cellular requirements for thymic selection are different. In contrast to conventional T cells, selection is at least as efficient when the selecting ligand (Qa-1b) is expressed only on hemopoietic lineage cells as compared with expression on epithelial cells in the thymus (32). Similarly, Urdahl et al. (34) have demonstrated that polyclonal H2-M3-restricted T cells can be selected efficiently on hemopoietic cells, and NK-T cells are selected by interaction with CD1d on hemopoietic cells in the thymus (35, 36). Thus, it is possible that class Ib-restricted T cells, in general, are selected through unconventional pathways in the thymus. In the present study, we examined the possibility that Qa-1-restricted 6C5 T cells may be capable of cross-reacting with classical class I molecules. Contrary to expectation, we observed that 6C5 T cells undergo thymic deletion in Qa-1b-expressing H-2q haplotype mice. Additional experiments demonstrated that 6C5 T cells directly cross-recognize H-2Dq class Ia molecules, despite the requirement for interaction with the class Ib molecule Qa-1 for positive selection. In addition, we provide preliminary evidence for a high frequency of class Ia-reactive T cells among the polyclonal CD8+ T cell population selected by interaction with nonclassical class I molecules in class Ia-deficient mice. C57BL/10SnJ, B10.D1-H2q/SgJ, B10.D2-Hc1 H2d H2-T18c/nSnJ, B10.AKM-H2m H2-T18a/SnJ, B10.A H2h2/(2R)SgSnJ, BALB/cJ, and C3H/HeJ mice were purchased from The Jackson Laboratory. 2C (37), 6C5.B6, 6C5.RAG−/−, 6C5.RAG−/−.Thy1.1 (32), and KbDb−/− (7) mice have been described previously. 6C5.H2bxq and 6C5.H2bxd mice were created by crossing 6C5.B6 with either B10.Q or B10.D2 mice. All mice were maintained following institutional guidelines. R1.1 and MHC class I-expressing R1.1 cell lines are thymoma cell lines derived from C58/J (H-2k) mice. R1.1, R1.1 Dq, R1.1 Lq, and R1.1 Ld were kindly provided by Dr. J. Connolly (Washington University, St. Louis, MO) (38). SV40-transformed fibroblasts from C3H.Q (SvCQ) and B10.AKM (SvAKM) were kindly provided by Dr. L. Gooding (Emory University, Atlanta, GA) (39). To measure CD69 expression on activated T cells, 5 × 105 fresh splenocytes from 6C5.B6 mice were cultured with either a titration of irradiated splenocytes from various strains of mice or 5 × 105 irradiated cell lines overnight at 37°C. To measure in vitro T cell proliferation, CD8+ T cells were purified from and labeled with CFSE as described in Adoptive transfer. A total of 2 × 105 CD8+ T CFSE-labeled cells was combined with 5 × 105 irradiated splenocytes and added to each well of round-bottom 96-well cell culture plates. After 72 h in culture, T cell proliferation was measured by analyzing CFSE dye dilution. In vitro assays were set up in MEM-α (Invitrogen Life Technologies) supplemented with glycine, penicillin-streptomycin, nonessential amino acids, sodium pyruvate, gentamicin, and 10% heat-inactivated FBS. Kq was amplified from the cDNA via PCR using the primers KqHindIII.F (aaaaaagcttccaccATGCTGCTCCTGCTGTTGG) and KqEcoRI.R (aaaagaattctaCGCTAGAGAATGAGGGTCATG) followed by HindIII/EcoRI ligation into the pcDNA3.0 vector (Invitrogen Life Technologies); Dq was cloned by HindIII/BamHI ligation of the PCR product between the primers DqHindIII.F (aaaaaagcttccaccATGGGGGCGATGGCTCCG) and DqBamHI.R (aaaaggatcctaTCGGAGAGACATTTCAG) into the pcDNA3.0 vector (Invitrogen Life Technologies). The cDNA for Kq PCR was obtained by isolating mRNA from H-2q mice using TRIzol reagent (Invitrogen Life Technologies) followed by cDNA synthesis using SuperScript First-Strand Synthesis System for RT-PCR (Invitrogen Life Technologies). The cDNA for Dq PCR was obtained from the R1.1 Dq cell line by the same procedure. The plasmids were purified using a Qiagen Maxiprep kit and sequenced. Dq and Kq constructs were transiently transfected into COS 7.2 cells by the DEAE-dextran method (40). Transfection and culture conditions were described previously (41). Cells were harvested 60 h posttransfection for analysis by flow cytometry and for use in in vitro stimulation assays. Anesthetized mice were given i.v. immunizations with 20 × 106 fresh splenocytes. Eighteen to 24 h after immunization, spleens were harvested, and CD69 expression was measured via flow cytometry. Single-cell suspensions prepared from freshly isolated lymph nodes (inguinal) and spleens were incubated with bead-conjugated anti-CD8α (53-6.7) (1/10 dilution) in MACS buffer (PBS with 2 mM EDTA, 0.2% BSA) for 30 min at 4°C. Cells were washed with PBS and passed over a MACS column according to the manufacturer’s instructions (Miltenyi Biotec). Positively selected cells were 90–98% CD8α+ for 6C5.B6 and B10.KbDb−/− CD8+ cells were 68–75% pure. For analysis of CD8+ T cell proliferation, cells were labeled with the fluorescent dye CFSE (Molecular Probes) as described previously (33). Briefly, CD8α+ cells were labeled with CFSE and washed in PBS. Cells were then transferred i.v. into mice that had been sublethally irradiated (600–700 rad) 3–24 h earlier or into nonirradiated hosts. Three to 6 days after transfer, spleen and lymph node (inguinal) cells were pooled from individual mice and analyzed for CFSE dilution by flow cytometry. For adoptive transfer into nonirradiated hosts, NK cells were depleted by giving mice injections with 600 μg of anti-NK1.1 Ab (PK136) 1 day before transfer and with 300 μg of anti-NK1.1 Ab 1 day after transfer. Single-cell suspensions prepared from cultured cells or freshly isolated lymph nodes (inguinal) and spleens were incubated with mAbs for 20 min at 4°C. Cells were washed twice, fixed with 1% paraformaldehyde, and analyzed by flow cytometry. FITC-, PE-, PerCP-, or biotin-conjugated Abs specific for murine CD8α (53-6.72), CD8β (53-5.8), CD69 (H1.2F3), Thy1.1 (OX-7), Thy1.2 (53-2.1), Vα3.2 (RR3-16), Vβ5.1/5.2 (MR9h4), H-2 Dq/Lq (KH117), H-2 Db (KH95), and Qa-1b (6A8.6F10.1A6) (BD Pharmingen and American Type Culture Collection) were used in various combinations for flow cytometric analysis. Biotinylated Abs were developed with allophycocyanin-conjugated streptavidin (Molecular Probes). IB2 was used to identify 2C transgenic T cells and has been described previously (42). Fluorescence was analyzed using a FACSCalibur (BD Biosciences). Live gates were set on lymphocytes by forward- and side-scatter profiles. Live lymphocytes were collected and then analyzed using CellQuest software (BD Biosciences). 6C5 splenic lymphocytes (1 × 106 cells) were combined with 8 × 106-irradiated B6 stimulators in each well of 24-well plates. The splenocytes were cultured in complete MEM-alpha (Invitrogen Life Technologies) supplemented with 100 μg/ml bovine insulin and 50 U/ml rIL-2 for 5 days. Live cells were purified using lymphocyte separation medium. Activated T cells were cultured with prepulsed (51Cr) T2-g37 cells (24), SvCQ cells, or SvAKM cells with or without 5 μM bovine insulin (Elanco Animal Health). Effector and target cells were mixed at the indicated E:T ratios. The cells were centrifuged at 500 rpm for 30 s to initiate cell-cell contact and incubated for 4 h in quadruplicate wells at 37°C. 51Cr release was measured by quantitating cpm using a scintillation counter, and the percentage of specific killing was calculated as follows: ((sample cpm − spontaneous cpm)/(maximal cpm − spontaneous cpm)) × 100. Millipore Multiscreen HA filter plates were coated overnight at 4°C with 4 μg/ml purified anti-IFN-γ (BD Pharmingen). After washing with 0.05% Tween 20 in PBS, the plates were then blocked with complete MEM-alpha for 2 h at 37°C. MACS bead-sorted CD8+ T cells were titrated at a 1/2 dilution into the plates, starting at 1 × 106 cells/well. Irradiated (2500 rad) splenocytes (5 × 105) were added as stimulators. The cells were cultured for 24 h at 37°C in MEM-alpha supplemented with 40 U/ml IL-2. After extensive washing, 4 μg/ml secondary Ab was added, and the plates were incubated for 2 h at 37°C. Spots were developed and counted as described previously (43). Studies with radiation bone marrow chimeras have demonstrated that the cellular requirements for positive selection of Qa-1-restricted 6C5 T cells differ from conventional T cells in that selection is mediated efficiently by Qa-1 expressed on hemopoietic lineage cells in the thymus (32). We were interested in determining whether these T cells differ from conventional CD8+ T cells in their capacity to undergo superantigen-mediated negative selection. We took advantage of the fact that 6C5 T cells express a Vβ5+ TCR, and thus they should be susceptible to endogenous superantigen-mediated deletion in mouse mammary tumor virus 9 (MTV-9)-positive mice that express I-E MHC class II molecules (44). MTV-9+ 6C5.B6 mice were crossed with H-2d mice (Table I⇓) to generate I-E+ 6C5.H-2bxd animals. As shown in Fig. 1⇓, 6C5 T cells undergo deletion in the thymus of 6C5.H-2bxd mice. CD4+CD8+ double-positive and CD8+ single-positive thymocytes are almost completely absent in 6C5.H-2bxd mice, and few transgenic CD8+Vβ5+ T cells are present in peripheral lymphoid organs. A large population of CD8−Vβ5+ T cells was present in these mice. Understanding the genesis and characteristics of these cells will require further investigation. Nevertheless, the results indicate that the development of CD8+ Qa-1-restricted 6C5 T cells is markedly disturbed in I-E+ mice, supporting the conclusion that 6C5 T cells are susceptible to superantigen-mediated clonal deletion. 6C5 T cells are negatively selected on a H-2bxd and on a H-2bxq genetic background 6C5.B6 were crossed with either H-2d or H-2q mice. 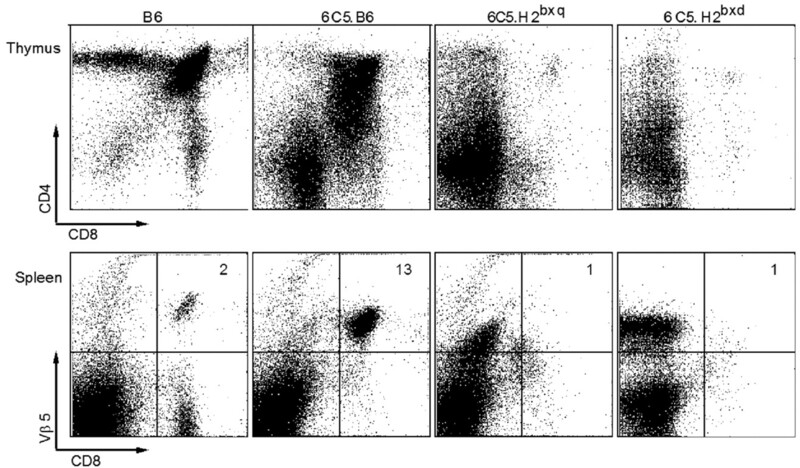 Lymphocytes from the thymus and spleen of B6, 6C5.B6, 6C5.H-2bxq, and 6C5.H-2bxd were analyzed for cell surface expression of CD8, CD4, and Vβ5 by flow cytometry. Numbers indicate the percentage of indicated subpopulations. Data are representative of at least three mice in each group. Unexpectedly, we also observed clonal deletion when 6C5.B6 mice were crossed with H-2q animals (Fig. 1⇑). 6C5.H-2bxq mice do not express I-E, which is thought to be required for efficient deletion of T cells with specificity for MTV-9 encoded endogenous superantigen (45, 46, 47). The 6C5.H-2bxq mice express exclusively the Qa-1b allele, and thus deletion could not be explained by alloreactivity with a mismatched Qa-1 molecule. We considered the possibility that 6C5 T cells may be unusually sensitive to deletion mediated by a weak interaction between MTV-9-encoded superantigen and IAq class II molecules. Alternatively, these Qa-1-restricted T cells might cross-react directly with an MHC molecule encoded by H-2q, or they might recognize a polymorphic peptide controlled by H-2 that is presented by Qa-1b molecules. To examine the possibility that 6C5 T cells may be alloreactive to H-2q, transgenic mice were immunized with splenocytes from either B10 (H-2b) or B10.Q (H-2q) mice. Spleen and lymph nodes were removed 18 h after i.v. immunization and analyzed for T cell activation by measuring the level of expression of the activation marker CD69 on transgenic T cells. As shown in Fig. 2⇓A, a subpopulation of 6C5 T cells express CD69 after immunization with B10.Q but not B10 spleen cells. As a control, H-2Ld alloreactive 2C TCR transgenic mice (48) were immunized with H-2d BALB/c spleen cells. The fraction of 2C T cells expressing CD69 after alloimmunization was similar to that observed with 6C5 T cells under parallel experimental conditions (Fig. 2⇓A). 6C5.B6 T cells react in vivo to cells of the H-2q haplotype. A, 2C (H-2b) and 6C5.B6 (H-2b) transgenic mice were immunized with 20 × 106 spleen cells from either MHC syngeneic (B10) or allogeneic (BALB/c and B10.Q) mice. After 18 h, the level of CD69 expression on transgenic T cells was analyzed by gating on CD8+IB2+ 2C transgenic T cells or CD8+Vα3.2+Vβ5+ 6C5 transgenic T cells. (IB2 is a clonotypic Ab specific for 2C transgenic T cells.) Filled histograms are shown overlaid with open histograms for the syngeneic or unimmunized controls. Numbers indicate the percentage of indicated subpopulations. B, CD8+ T cells from 6C5.B6 TCR transgenic mice were labeled in vitro with CFSE and transferred into sublethally irradiated (600 rad) B10 and B10.Q mice. Six days after transfer, lymphocytes from the spleens and inguinal lymph nodes of recipient mice were analyzed for cell surface expression of CD8 and Vβ5. Proliferation of CD8+Vβ5+ T cells is shown by the dilution of CFSE. C, CD8+ T cells from 6C5.RAG−/−.Thy1.1 mice were labeled with CFSE and transferred into nonirradiated, NK1.1+-depleted B10 or B10.Q mice. Three days after transfer, lymphocytes from the spleens and inguinal lymph nodes of recipient mice were analyzed for cell surface expression of CD8 and Thy1.1. Proliferation of CD8+Thy1.1+ T cells is shown by the dilution of CFSE. To further test the ability of 6C5 T cells to become activated in response cells expressing H-2q molecules, we adoptively transferred CFSE-labeled 6C5 T cells into sublethally irradiated B10 or B10.Q mice. T cell proliferation was measured after 6 days by analysis of CFSE dye dilution. The degree of proliferation was considerably greater in the B10.Q host as compared with B10 (Fig. 2⇑B). Some proliferation was also observed in irradiated B10 recipients, reflecting the capacity of 6C5 T cells to undergo homeostatic expansion after transfer to lymphopenic hosts (33). Transgenic 6C5 T cells were also observed to proliferate after transfer into unirradiated B10.Q mice (Fig. 2⇑C). By contrast, no proliferation was observed after transfer into control unirradiated B10 mice. Thus, 6C5 T cells can be activated in vivo in response to a determinant expressed in H-2q mice. The capacity of 6C5 T cells to respond in vitro to H-2q was analyzed by overnight culture of 6C5 T cells with irradiated splenocytes of various haplotypes. As shown in Fig. 3⇓A, 6C5 T cells up-regulate CD69 in a dose-dependent manner in response to B10.Q but not B10 or B10.D2 spleen cells. Similarly, CFSE-labeled 6C5 T cells proliferated uniformly during a 72-h culture with B10.Q stimulators (Fig. 3⇓B). Only a small fraction of T cells proliferated in response to B10.D2 spleen cells in these assays. The strong in vitro response to B10.Q but not B10.D2 supports the conclusion that there is a fundamental difference in the mechanism responsible for the thymic deletion observed in 6C5.H-2bxd vs 6C5.H-2bxq mice. In the former case, thymic deletion can be explained by endogenous superantigen, whereas deletion in 6C5.H-2bxq mice appears to be mediated by an allogeneic determinate encoded by H-2q. 6C5 T cells alloreact with H-2Dq class Ia molecules. 6C5 splenocytes were cultured in vitro with cells that express various MHC molecules to map the activating ligand. A, 6C5.RAG−/− splenocytes were cocultured with a titration of irradiated B10 (H-2b), B10.Q (H-2q), or B10.D2 (H-2d) splenocytes. After overnight culture, the cells were analyzed for cell surface expression of CD8, and Vα3.2. T cell activation was measured by analyzing CD69 expression on CD8+Vα3.2+ T cells. B, CD8+ T cells from 6C5.RAG−/−.Thy1.1 mice were labeled with CFSE and cocultured with splenocytes from B10, B10.Q, or B10.D2 mice in vitro for 3 days. The cells were then analyzed for CFSE dilution of CD8+Thy1.1+ T cells. C, Irradiated (R1.1) cells stably transfected to express Lq, Dq, or Ld were cultured in vitro with 6C5.B6 spleen cells overnight. T cell activation was measured by analyzing CD69 expression on CD8+Vα3.2+ T cells. D, COS cells were transiently transfected to express Kq, Dq, or Qa-1b alone or in various combinations, and then cultured with 6C5.B6 splenocytes to test their ability to activate 6C5 T cells. After overnight culture, T cell activation was measured by analyzing CD69 expression on CD8+Vα3.2+ T cells. B10.Q mice express the classical MHC molecules Dq, Lq, Kq, and IAq and a variety of nonclassical class I molecules including Qa-1b. To map the restriction element, 6C5 T cells were cultured with R1.1, a C58/J (H-2k) thymoma cell line, and R1.1 transfectants expressing Dq, Lq, or Ld class Ia molecules (49). The 6C5 T cells up-regulated CD69 in response to R1.1 cells expressing Dq but not other class I molecules (Fig. 3⇑C). In complementary experiments, the capacity of 6C5 T cells to respond to COS cells transiently expressing various class I molecules was evaluated. The Qa-1-restricted T cells were activated by COS cells expressing Dq but not other class I molecules, including Kq and Lq (Fig. 3⇑D). The response to Dq was not affected by coexpression of Qa-1b molecules, suggesting that 6C5 T cells directly recognize Dq, as opposed to recognition of a Dq-derived peptide presented by Qa-1. The experiments described above did not fully exclude a mechanism involving indirect presentation of a Dq-derived peptide by Qa-1b. The 6C5 T cells express Qa-1b, and thus it was conceivable that these T cells might present a Dq-derived peptide to each other in culture. To further address this possibility, CFSE-labeled 6C5 T cells were transferred into sublethally irradiated B10.AKM recipients, which express Dq and Qa-1a but not Qa-1b (Table I⇑). We reasoned that the transferred T cells would be diluted sufficiently in the host to prevent direct T cell-T cell Ag presentation. Labeled 6C5 T cells were observed to proliferate vigorously in B10.AKM recipients expressing Dq and Qa-1a but not Qa-1b (Fig. 4⇓A). By contrast, only homeostatic proliferation was observed in control B10 and B10.H2 mice. The latter express Kk, I-Ek, and IAk like B10.AKM, but they express Dd rather than Dq (Table I⇑). Dq-mediated activation of 6C5 T cells occurs as a result of direct recognition of Dq. A, Lymphopenia-induced proliferation of 6C5.B6 T cells. CFSE-labeled CD8+ 6C5.B6 transgenic T cells were transferred into sublethally irradiated (600 rad) B10 (H-2b), B10.Q (H-2q), B10.H2 (H-2h2), or B10.AKM (H-2m) hosts. Six days after transfer, lymphocytes from the spleens and inguinal lymph nodes of recipient mice were analyzed for cell surface expression of CD8 and Vβ5. Proliferation of CD8+Vβ5+ T cells is shown by the dilution of CFSE. B, CTL killing of Dq-expressing targets by 6C5 T cells. 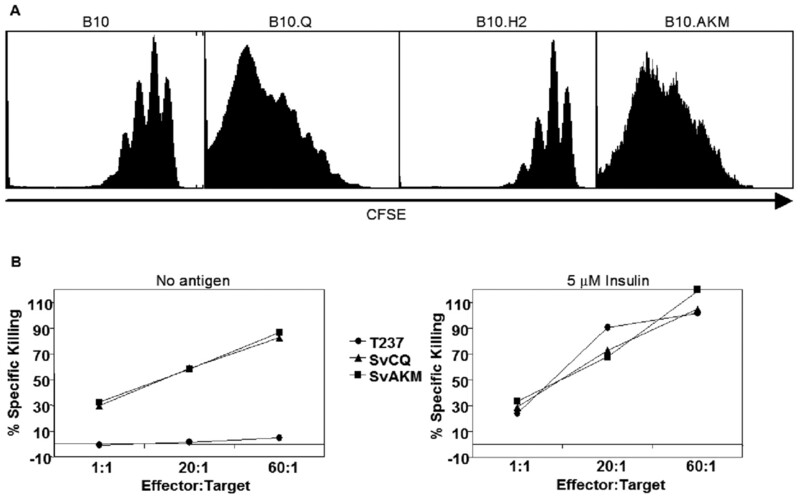 Activated 6C5.B6 T cells were incubated with chromium-labeled SvCQ (H-2q), SvAKM (H-2m), and T2-g37 (H-2b expressing Qa-1b) target cells, with or without 5 mM insulin. Effector and target cells were mixed at the indicated ratios and incubated for 4 h in quadruplicate wells. Specific 51Cr release was measured as described in Materials and Methods. An indirect presentation mechanism involving Qa-1b was excluded definitively through killing assays using target cells expressing Dq and Qa-1a but not Qa-1b. Because only the targets are labeled in the chromium release assays, we were able to show that 6C5 T cells directly recognize Dq in the absence of Qa-1b. Activated 6C5 T cells were observed to kill chromium-labeled SV40-transformed fibroblast cells lines (39) from C3H.Q (SvCQ) and B10.AKM (SvAKM) with equal efficiency (Fig. 4⇑B). No killing was observed with T2g37, a human cell line expressing high levels of Qa-1b. However, T2g37 targets were killed efficiently in the presence of soluble insulin (Fig. 4⇑B). Thus, we conclude that 6C5 T cells directly cross-react with the class Ia molecule Dq, despite their clear specificity for nonclassical Qa-1b molecules, as demonstrated by the requirement for Qa-1b for thymic development and for recognition of insulin (32). Given the finding that Qa-1b-restricted 6C5 T cells can cross-react with a class Ia molecule, we were interested in exploring whether this might be a general feature of CD8+ T cells that are selected in the thymus by interaction with nonclassical class I molecules. As an initial approach to address this issue, purified CD8+ T cells from class Ia-deficient KbDb−/− mice were cultured with irradiated stimulator cells from syngeneic KbDb−/− mice, MHC-matched class Ia expressing B10 mice, and from several MHC-mismatched strains of mice. The frequency of responding cells in 24-h cultures was measured in IFN-γ ELISPOT assays. The frequency of CD8+ T cells from KbDb−/− mice responding to allogeneic stimulator cells was equal to or greater than that observed with conventional CD8+ T cells from B10 mice (Fig. 5⇓). A substantial fraction of CD8+ T cells from KbDb−/− mice also respond to the H-2b class Ia molecules expressed on B10 stimulator cells. These findings raise the possibility that there may be a substantial degree of T cell cross-recognition of class Ia and class Ib molecules, with nonclassical class I molecules acting more like alleles than fundamentally different ligands from the point of view of the TCR. A high large fraction of polyclonal T cells selected by class Ib molecules appear to cross-react with class Ia molecules. CD8+ T cells from KbDb−/− and B10 mice were cocultured in anti-IFN-γ-coated ELISPOT plates with splenocytes from B10 (H-2b), KbDb−/− (H-2b), B10.Q (H-2q), C3H (H-2k), BALB/c (H-2d), and B10.D2 (H-2d). After 24-h incubation, IFN-γ-producing cells were enumerated by developing and counting ELISPOTs. 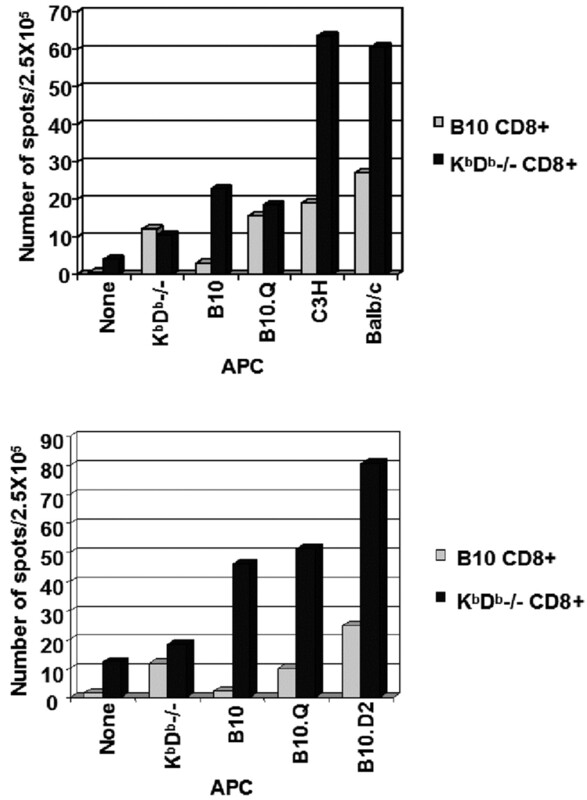 The purity of CD8+ T cells from KbDb−/− mice was ∼70% and was ∼90% from B10 mice. CD4+ T cells represented <5–10% of the responder T cell populations. The results from two independent experiments are shown. In the present study, transgenic 6C5 T cells expressing a TCR with specificity for the class Ib molecule Qa-1b were evaluated for the capacity to cross-recognize classical class I molecules. This possibility was supported by the unexpected observation that thymic deletion occurs in 6C5.H-2bxq mice, which express the Qa-1b allele and do not express I-E, which is normally required for superantigen-mediated negative selection. 6C5 T cells were observed to respond in vivo and in vitro to spleen cells from allogeneic H-2q mice. The data support the conclusion that 6C5 T cells directly cross-react with H-2Dq molecules, indicating that alloreactivity with a class Ia molecule is responsible for the clonal deletion observed in 6C5.H-2bxq mice. To our knowledge, this is the first demonstration of cross-recognition of defined class Ib and class Ia molecules by a single TCR. Thymic selection of Qa-1-restricted 6C5 T cells and polyclonal H2-M3-restricted T cells differ from conventional T cells in that these cells can be selected by hemopoietic lineage cells expressing the appropriate class Ib molecule (32, 34). Results presented here demonstrate that 6C5 T cells share with conventional T cells a capacity to be negatively selected by endogenous superantigen or cross-reacting alloantigen. A major fraction of thymocytes that have sufficient affinity for self class Ia molecules for positive selection are deleted through negative selection mechanisms involving recognition of self peptides bound to the selecting MHC molecule or other expressed MHC molecules (50). It remains an open question as to whether a large fraction of the thymocytes undergoing positive selection by interaction with Qa-1 are deleted subsequently by interaction with agonist self peptide bound to Qa-1 or by class Ia molecules. The repertoire of peptides bound to Qa-1 under physiological conditions is probably very limited, and this may limit the population of ligands available to mediate negative selection. In addition, Qa-1 is expressed at lower levels at the cells surface as compared with class Ia molecules, and there is evidence that Qa-1-peptide complexes are generally unstable (51). These properties might also limit the extent of negative selection mediated by Qa-1. In preliminary experiments, we have had difficulty inducing acute thymic deletion in 6C5 mice by injecting agonist Ag (insulin or insulin B chain peptides); however, there are a number of technical issues that must be addressed before any conclusions can be made regarding the capacity of Qa-1 to mediate negative selection. Transgenic 6C5 T cells were observed to up-regulate CD69 and proliferate both in vitro and in vivo in response to H-2q spleen cells. The response was mapped to Dq in experiments with transfectants expressing different H-2q haplotype class I molecules. The dominant peptide presented by Qa-1, Qdm, is derived from the leader sequence of H-2D/L class Ia molecules, and a polymorphism in the leader sequence can be distinguished by some alloreactive T cells (21). However, the class Ia leader peptides expressed in H-2q are identical with those present in H-2b class I molecules in 6C5 mice. We considered the possibility that 6C5 T cells might react with a peptide derived from a polymorphic region of the Dq protein presented by Qa-1b. However, 6C5 T cells respond to a nonmurine cell line expressing Dq in the absence of Qa-1, as well as spleen cells that express Dq and Qa-1a but not the selecting allele, Qa-1b. In addition, activated 6C5 T cells kill target cells that express Dq but not Qa-1b. Based on these findings, we conclude that the 6C5 TCR directly recognizes Dq. Selection by class Ib molecules appears to contribute only a small fraction of the total CD8+ T cell pool, as judged by the small number of CD8+ single-positive thymocytes and peripheral T cells in class Ia-deficient KbDb−/− mice (7). The output of class Ib-restricted CD8+ T cells might even be overrepresented in KbDb−/− animals because of the absence of class Ia molecules, which could potentially delete a sizable fraction of the thymocytes selected by class Ib molecules. In addition, it is possible that development of class Ib-restricted thymocytes may be reduced in a setting where they must compete for limiting factors with a large population of class Ia-selected thymocytes. The quantitative contribution of class Ib molecules to the CD8+ T cell repertoire, and the extent to which specific class Ib molecules such as Qa-1 and H2-M3 contribute, needs to be further investigated. It has been demonstrated previously that polyclonal CD8+ T cells from KbDb−/− mice have a capacity to recognize class Ia molecules. Vugmeyster et al. (7) were able to generate cytolytic T cell responses to H-2b and H-2d class Ia molecules by priming and boosting KbDb−/− mice with B6 or BALB/c spleen cells, followed by an in vitro restimulation to further expand and activate precursor cells. Seaman et al. (52) reported the generation of class Ia-specific CTL activity in primary MLC using KbDb−/− responder cells without a requirement for in vivo priming. In addition, Maurice et al. (53) reported the development of CD8+ 2C TCR transgenic T cells in fetal thymic organ cultures originating from class Ia-deficient 2C.KbDb−/− mice and in neonatal 2C.KbDb−/− animals. The 2C TCR is positively selected by Kb and alloreactive with Ld class Ia molecules, yet it appears to cross-react with a class Ib molecule that is expressed in fetal and neonatal thymus. These studies demonstrate that there can be cross-recognition of class Ia and class Ib molecules, but the identity of the class Ib molecules has not been defined. Our results provide an example of a TCR with clear specificity for Qa-1b that can cross-react with a specific class Ia molecule, Dq. It is clear that the 6C5 TCR is not cross-reactive generally with class I molecules. It does not recognize the class I molecules encoded in H-2b and H-2d, nor does it react with Kq or Lq. In addition, 6C5 T cells are not selected by Qa-1a molecules, and Qa-1a does not present insulin in these T cells. The capacity to cross-react with a subset of class Ia molecules may be a general feature of T cells that are positively selected by Qa-1 molecules. There is considerable sequence homology (∼75% amino acid identity) between Qa-1 and polymorphic mouse class Ia molecules, and thus Qa-1 might act more like a class I allelic product than a fundamentally different ligand in its interactions with TCR. The frequency of polyclonal class Ib-restricted CD8+ T cells that can cross-recognize class Ia molecules appears to be comparable to the frequency of alloreactive class Ia-restricted T cells, based on experiments measuring the frequency of IFN-γ-producing CD8+ T cells in primary MLC. The observed frequencies would almost certainly be higher if other assays for alloreactivity were used (5), a possibility that we are investigating. It should be noted that CD8+ T cells from KbDb−/− mice express activation markers (34, 52), and thus they may more readily produce IFN-γ in response to allogeneic stimulation, as compared with conventional naive T cells. Thus, this issue requires further investigation. Nevertheless, our results provide a clear example of a Qa-1-specific TCR that can cross-react with a class Ia molecule, and preliminary evidence supporting the idea that this may be a common property of T cells selected by class Ib molecules. We thank Dr. Taku Kambayashi, Dr. Gil Kersh, Brent Koehn, and Dr. Xinjian Chen for advice. We are grateful to Drs. Janet Connolly, Linda Gooding, and Christian Larsen for critical reagents. We thank Dr. Dominique Weber, David Jay, and Phil Swanson for help with procedures. ↵1 This work was supported by National Institutes of Health Grants AI33614 and AI30554 (to P.E.J.). ↵3 Abbreviations used in this paper: Qdm, Qa-1 determinant modifier; MTV-9, mammary tumor virus 9. Zerrahn, J., W. Held, D. H. Raulet. 1997. The MHC reactivity of the T cell repertoire prior to positive and negative selection. Cell 88: 627-636. Sebzda, E., S. Mariathasan, T. Ohteki, R. Jones, M. F. Bachmann, P. S. Ohashi. 1999. Selection of the T cell repertoire. Annu. Rev. Immunol. 17: 829-874. Sherman, L. A., S. Chattopadhyay. 1993. The molecular basis of allorecognition. Annu. Rev. Immunol. 11: 385-402. Suchin, E. J., P. B. Langmuir, E. Palmer, M. H. Sayegh, A. D. Wells, L. A. Turka. 2001. Quantifying the frequency of alloreactive T cells in vivo: new answers to an old question. J. Immunol. 166: 973-981. Shawar, S. M., J. M. Vyas, J. R. Rodgers, R. R. Rich. 1994. Antigen presentation by major histocompatibility complex class I-B molecules. Annu. Rev. Immunol. 12: 839-880. Vugmeyster, Y., R. Glas, B. Perarnau, F. A. Lemonnier, H. Eisen, H. Ploegh. 1998. Major histocompatibility complex (MHC) class I KbDb−/− deficient mice possess functional CD8+ T cells and natural killer cells. Proc. Natl. Acad. Sci. USA 95: 12492-12497. Kurepa, Z., J. Su, J. Forman. 2003. Memory phenotype of CD8+ T cells in MHC class Ia-deficient mice. J. Immunol. 170: 5414-5420. Rolph, M. S., S. H. Kaufmann. 2000. Partially TAP-independent protection against Listeria monocytogenes by H2-M3-restricted CD8+ T cells. J. Immunol. 165: 4575-4580. Seaman, M. S., C. R. Wang, J. Forman. 2000. MHC class Ib-restricted CTL provide protection against primary and secondary Listeria monocytogenes infection. J. Immunol. 165: 5192-5201. Kerksiek, K. M., D. H. Busch, I. M. Pilip, S. E. Allen, E. G. Pamer. 1999. H2-M3-restricted T cells in bacterial infection: rapid primary but diminished memory responses. J. Exp. Med. 190: 195-204. Lenz, L. L., M. J. Bevan. 1996. H2-M3 restricted presentation of Listeria monocytogenes antigens. Immunol. Rev. 151: 107-121. Lo, W. F., H. Ong, E. S. Metcalf, M. J. Soloski. 1999. T cell responses to Gram-negative intracellular bacterial pathogens: a role for CD8+ T cells in immunity to Salmonella infection and the involvement of MHC class Ib molecules. J. Immunol. 162: 5398-5406. Panoutsakopoulou, V., K. M. Huster, N. McCarty, E. Feinberg, R. Wang, K. W. Wucherpfennig, H. Cantor. 2004. Suppression of autoimmune disease after vaccination with autoreactive T cells that express Qa-1 peptide complexes. J. Clin. Invest. 113: 1218-1224. Hu, D., K. Ikizawa, L. Lu, M. E. Sanchirico, M. L. Shinohara, H. Cantor. 2004. Analysis of regulatory CD8 T cells in Qa-1-deficient mice. Nat. Immunol. 5: 516-523. Jiang, H., N. S. Braunstein, B. Yu, R. Winchester, L. Chess. 2001. CD8+ T cells control the TH phenotype of MBP-reactive CD4+ T cells in EAE mice. Proc. Natl. Acad. Sci. USA 98: 6301-6306. Jiang, H., L. Chess. 2000. The specific regulation of immune responses by CD8+ T cells restricted by the MHC class Ib molecule, Qa-1. Annu. Rev. Immunol. 18: 185-216. Hermel, E., A. J. Hart, R. Miller, C. J. Aldrich. 1999. CTL and sequence analyses of MHC class IB antigens Qa1c (H2-T23r) and Qa1d (H2-T23f). Immunogenetics 49: 712-717. Aldrich, C. J., J. R. Rodgers, R. R. Rich. 1988. Regulation of Qa-1 expression and determinant modification by an H-2D-linked gene, Qdm. Immunogenetics 28: 334-344. Lindahl, K. F., B. Hausmann, L. Flaherty. 1982. Polymorphism of a Qa-1-associated antigen defined by cytotoxic T cells. I. Qed-1a and Qed-1d. Eur. J. Immunol. 12: 159-166. Aldrich, C. J., A. DeCloux, A. S. Woods, R. J. Cotter, M. J. Soloski, J. Forman. 1994. Identification of a Tap-dependent leader peptide recognized by alloreactive T cells specific for a class Ib antigen. Cell 79: 649-658. DeCloux, A., A. S. Woods, R. J. Cotter, M. J. Soloski, J. Forman. 1997. Dominance of a single peptide bound to the class I(B) molecule, Qa-1b. J. Immunol. 158: 2183-2191. Cotterill, L. A., H. J. Stauss, M. M. Millrain, D. J. Pappin, D. Rahman, B. Canas, P. Chandler, A. Stackpoole, E. Simpson, P. J. Robinson, P. J. Dyson. 1997. Qa-1 interaction and T cell recognition of the Qa-1 determinant modifier peptide. Eur. J. Immunol. 27: 2123-2132. Vance, R. E., J. R. Kraft, J. D. Altman, P. E. Jensen, D. H. Raulet. 1998. Mouse CD94/NKG2A is a natural killer cell receptor for the nonclassical major histocompatibility complex (MHC) class I molecule Qa-1b. J. Exp. Med. 188: 1841-1848. Kraft, J. R., R. E. Vance, J. Pohl, A. M. Martin, D. H. Raulet, P. E. Jensen. 2000. Analysis of Qa-1b peptide binding specificity and the capacity of CD94/NKG2A to discriminate between Qa-1-peptide complexes. J. Exp. Med. 192: 613-624. Bouwer, H. G., M. S. Seaman, J. Forman, D. J. Hinrichs. 1997. MHC class Ib-restricted cells contribute to antilisterial immunity: evidence for Qa-1b as a key restricting element for Listeria-specific CTLs. J. Immunol. 159: 2795-2801. Lo, W. F., A. S. Woods, A. DeCloux, R. J. Cotter, E. S. Metcalf, M. J. Soloski. 2000. Molecular mimicry mediated by MHC class Ib molecules after infection with Gram-negative pathogens. Nat. Med. 6: 215-218. Davies, A., S. Kalb, B. Liang, C. J. Aldrich, F. A. Lemonnier, H. Jiang, R. Cotter, M. J. Soloski. 2003. A peptide from heat shock protein 60 is the dominant peptide bound to Qa-1 in the absence of the MHC class Ia leader sequence peptide Qdm. J. Immunol. 170: 5027-5033. Chun, T., C. J. Aldrich, M. E. Baldeon, L. V. Kawczynski, M. J. Soloski, H. R. Gaskins. 1998. Constitutive and regulated expression of the class IB molecule Qa-1 in pancreatic β cells. Immunology 94: 64-71. Jiang, H., S. Curran, E. Ruiz-Vazquez, B. Liang, R. Winchester, L. Chess. 2003. Regulatory CD8+ T cells fine-tune the myelin basic protein-reactive T cell receptor Vβ repertoire during experimental autoimmune encephalomyelitis. Proc. Natl. Acad. Sci. USA 100: 8378-8383. Tompkins, S. M., J. R. Kraft, C. T. Dao, M. J. Soloski, P. E. Jensen. 1998. Transporters associated with antigen processing (TAP)-independent presentation of soluble insulin to αβ T cells by the class Ib gene product, Qa-1b. J. Exp. Med. 188: 961-971. Sullivan, B. A., P. Kraj, D. A. Weber, L. Ignatowicz, P. E. Jensen. 2002. Positive selection of a Qa-1-restricted T cell receptor with specificity for insulin. Immunity 17: 95-105. Sullivan, B. A., L. M. Reed-Loisel, G. J. Kersh, P. E. Jensen. 2004. Homeostatic proliferation of a Qa-1b restricted T cell: a distinction between the ligands required for positive selection and for proliferation in lymphopenic hosts. J. Immunol. 173: 6065-6071. Urdahl, K. B., J. C. Sun, M. J. Bevan. 2002. Positive selection of MHC class Ib-restricted CD8+ T cells on hematopoietic cells. Nat. Immunol. 3: 772-779. Bendelac, A.. 1995. Positive selection of mouse NK1+ T cells by CD1-expressing cortical thymocytes. J. Exp. Med. 182: 2091-2096. Coles, M. C., D. H. Raulet. 2000. NK1.1+ T cells in the liver arise in the thymus and are selected by interactions with class I molecules on CD4+CD8+ cells. J. Immunol. 164: 2412-2418. Sha, W. C., C. A. Nelson, R. D. Newberry, D. M. Kranz, J. H. Russell, D. Y. Loh. 1988. Selective expression of an antigen receptor on CD8-bearing T lymphocytes in transgenic mice. Nature 335: 271-274. Hornell, T. M., N. Myers, T. H. Hansen, J. M. Connolly. 2003. Homology between an alloantigen and a self MHC allele calibrates the avidity of the alloreactive T cell repertoire independent of TCR affinity. J. Immunol. 170: 4506-4514. Gooding, L. R.. 1979. Specificities of killing by T lymphocytes generated against syngeneic SV40 transformants: studies employing recombinants within the H-2 complex. J. Immunol. 122: 1002-1008. Cullen, B. R.. 1987. Use of eukaryotic expression technology in the functional analysis of cloned genes. Methods Enzymol. 152: 684-704. Thayer, W. P., C. T. Dao, L. Ignatowicz, P. E. Jensen. 2003. A novel single chain I-Ab molecule can stimulate and stain antigen-specific T cells. Mol. Immunol. 39: 861-870. Kranz, D. M., S. Tonegawa, H. N. Eisen. 1984. Attachment of an anti-receptor antibody to non-target cells renders them susceptible to lysis by a clone of cytotoxic T lymphocytes. Proc. Nat. Acad. Sci. USA 81: 7922-7926. Murali-Krishna, K., J. D. Altman, M. Suresh, D. J. Sourdive, A. J. Zajac, J. D. Miller, J. Slansky, R. Ahmed. 1998. Counting antigen-specific CD8 T cells: a reevaluation of bystander activation during viral infection. Immunity 8: 177-187. Scherer, M. T., L. Ignatowicz, G. M. Winslow, J. W. Kappler, P. Marrack. 1993. Superantigens: bacterial and viral proteins that manipulate the immune system. Annu. Rev. Cell Biol. 9: 101-128. Bill, J., O. Kanagawa, J. Linten, Y. Utsunomiya, E. Palmer. 1990. Class I and class II MHC gene products differentially affect the fate of Vβ5 bearing thymocytes. J. Mol. Cell. Immunol. 4: 269-279. Liao, N. S., J. Maltzman, D. H. Raulet. 1990. Expression of the Vβ5.1 gene by murine peripheral T cells is controlled by MHC genes and skewed to the CD8+ subset. J. Immunol. 144: 844-848. Woodland, D., M. P. Happ, J. Bill, E. Palmer. 1990. Requirement for cotolerogenic gene products in the clonal deletion of I-E reactive T cells. Science 247: 964-967. Sha, W. C., C. A. Nelson, R. D. Newberry, J. K. Pullen, L. R. Pease, J. H. Russell, D. Y. Loh. 1990. Positive selection of transgenic receptor-bearing thymocytes by Kb antigen is altered by Kb mutations that involve peptide binding. Proc. Natl. Acad. Sci. USA 87: 6186-6190. Palmer, E.. 2003. Negative selection: clearing out the bad apples from the T-cell repertoire. Nat. Rev. Immunol. 3: 383-391. Kambayashi, T., J. R. Kraft-Leavy, J. G. Dauner, B. A. Sullivan, O. Laur, P. E. Jensen. 2004. The nonclassical MHC class I molecule Qa-1 forms unstable peptide complexes. J. Immunol. 172: 1661-1669. Seaman, M. S., B. Perarnau, K. F. Lindahl, F. A. Lemonnier, J. Forman. 1999. Response to Listeria monocytogenes in mice lacking MHC class Ia molecules. J. Immunol. 162: 5429-5436. Maurice, M. M., D. S. Gould, J. Carroll, Y. Vugmeyster, H. L. Ploegh. 2001. Positive selection of an MHC class-I restricted TCR in the absence of classical MHC class I molecules. Proc. Natl. Acad. Sci. USA 98: 7437-7442.